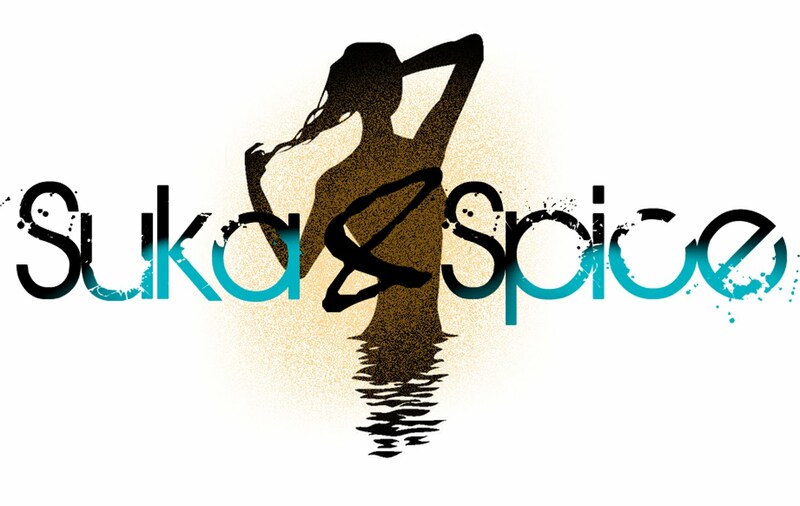 Suka & Spice™: Bananas For Classic Products! I can remember working at the Body Shop as a teenager--it being my first "real" job over the holidays. I'd make myself copious jars of samples, blow-dry the shrink wrap on gift baskets (I found this a thrilling chore), and use every last cent of my paycheck on products--all in the name of research, of course. I felt it was my dute to be thoroughly familiar with what I was selling, and I suppose it was even before that, when my crazy love affair with beauty products had began. 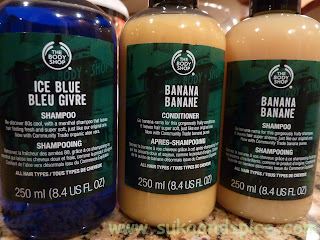 Some of my favorite products were their coconut hair oil, banana shampoo, and chamomile eye makeup remover (not that I wore any eye makeup at the time--but I could totally see its potential). Imagine my surprise when I walked into The Body Shop a couple of weeks ago, to find that they had brought back some of their classic old school products! These remind me of the good 'ol days. The scent of Ice Blue shampoo is minty and fresh--but doesn't have the lingering scent of a shampoo that's attacking chlorine. The Banana scents are just like they state--very banana-y, with the texture and color resembling a finely mashed banana. They don't weigh down the hair, yet do an excellent job of cleansing--something I've always admired Body Shop's hair line for. Although they're meant to be on shelves for a limited time, I was informed that they've gone beyond the original date that they were meant to be stocked--that's a good sign..perhaps they'll keep them out longer! Sure, it sounds a little hokey, but massage this into your roots and leave under a shower cap for 30 minutes or more--you'd be amazed at how shiny and hydrated it leaves your mane. Of course the key here is rinsing well. It's one thing to smell like bananas in the shower--an entirely different thing to have pieces falling off of your head on the street. I know this isn't for everyone, but I grew up eating the stuff for breakfast lunch and dinner. If you do try it, let me know! Another four bite the dust! *Stila Convertible Color Eye Liner in Plum - I can't wear plum liner another day--glad this is gonzo. I might add though, that plum is a nice daytime alternative to black and even brown. *VS Beauty Rush Gloss in Passion Fruit - my favorite scent of the bunch. I probably have six backups. *VS Beauty Rush Gloss in Strawberry Fizz - also a nice scent, but a little lighter and more sparkly than the Passion Fruit flavor. *LUSH Shower Jelly in Snow Showers (not pictured) - best kept in the freezer in between uses, these can be so chilling on a warm day, but I prefer the solid soaps. These easily wriggle out of your hands. That puts me at: eight products down, and two to go! This is the most progress I've made with this project...ever! How is your Project X Pan going? Do you plan to check out any of The Body Shop classics? Ohhh, I love Victoria's Secret Beauty Rush lip glosses, have a few. Never tried the passion fruit though, now you made me want it soooo much :))) Does it really remind you the smell of the fruit? @charmed-chick: hair masques & oil treatments never seem to fail! @resham: I've used eggs too! They help everything, don't you think? Egg whites for the face are a good trick too. Mee too im a bananas girl. I dont really like to eat them (or any fruit unless in smoothies or cocktails or deserts) but I loove to use them as hair treatments, facemasks and i love the flavouring in my lipbalms and gels! I was big on this body gel when it came out the first time around!!!!! Congrads on your project x pan progress - I need to go on one! And ummm why have I not heard of bananas for hair - I feel like I missed the boat!! Need to try that home mask pronto. Just wondeing -What is your fav treatment for the scalp? Hmm, can't say I 'm much of a banana type person...lol! And I 've never tried banana scented products either, perhaps I should tho! But then again, if I go into TBS and they 've already discontinued it? Gosh, I will have to try the banana concoction some time. It'll break up the monotony of my monthly G.Juarez deep conditioning visits. @rocaille: it's okay, these last two items are really lagging...taking FOREVER! @tina_mbc: i had to be strategic about what could be reasonable for this project. 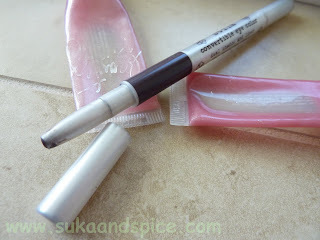 they were on their last leg..otherwise, a lip gloss takes me ages! @smngrown: did you go to the women's show? i didn't make it..but would love to hear feedback!